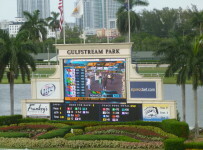 Gulfstream Park’s Sunday action starts at a 12:45 PM post time, with 12 races scheduled. Saturday’s results: The growing Rainbow 6 jackpot was not hit, so $276,725 is the new jackpot today. On Saturday, 33 winners each received $3,623. 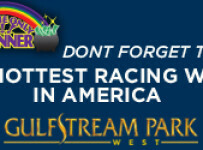 The highest odds winner was 11:1 in the 9th race. The Super Hi-5, and late pick-4 and pick-5 have no carryovers today. The Super Hi-5 should be on race 1 unless there are scratches. Eight horses are entered as of this morning.